The Maldives; a collection of 26 atolls in the Indian Ocean containing of sandbanks, coral ridges and desert islands: 340 km to the nearest land mass (India) and most the lowest lying country in the world. It is a quintessential tropical surfing destination; offshore reefs, crystal clear waters and a diverse ocean ecosystem home to whales, dolphins, rays, sharks and hundreds of thousand of species of fish. Yet, this is 2018 and there is no longer a chance to hide the reality of the situation; environmental disasters are impacting natural habitats at an alarming rate; plastic packaging waste, coral bleaching and the rise in sea levels are global threats, which the Maldives are also greatly affected by. Despite the marketing, The Maldives are not all turquoise waters and palm fringed beaches. Thanks to the exposure by Alison Teal and her TV series Alison’s Adventures (if you’re not check it out here), we are all aware of how the government introduced a waste management system far from the picturesque imagery in the holiday brochures. In order to deal with its plastic waste, The Maldives dedicated the Island next to the capital Male - Thilafushi - to trash, which since the 1990s has morphed into an island of waste; a toxic landfill piled high with discarded, rotting, burning plastic. As a traveller to the Maldives, I came armed with my natural sun cream, metal straw, reusable bottle and cloth bag, but still felt disheartened by the the amount of single use plastic that plagues many Islands… which in turn sparked a nagging sensation that I needed to do more. The good news is that education is changing everything, and even schools are proclaiming themselves to be “plastic free” as part of the solution to this huge problem. Another solution it seems, is being pioneered at high end resort Soneva Fushi. Situated in the Baa atoll, it has adopted an exceptional waste management system, where 90% of the island’s waste is recycled or repurposed. Their aim is to reach zero waste within the next 5 years and with this vision in mind, here lies hope for the future of these extraordinary Islands. Gordon Jackson does a remarkable job running the “Waste to wealth programme”. From growing mushrooms in plastic bottles, bottling its own water, composting green waste and turning glass into works of art - it is a complex system than aims to role out its initiatives to other local islands. The surfing season is May to October, but even in late November we are finding waves. The tides and wind affect the conditions greatly, and for approximately one hour each day in the afternoon we have scored perfect, waist to head high peeling lefts. Soneva’s sustainable surf programme takes guests to local and remote waves, encouraging the use of their eco products - bureo fins, revolve leashes and timber tech fire wire boards. My mission as a sustainability student interning here, is to make a surfboard from recycled styrofoam. With the resident glass blower a former surfboard shaper and one of the kids an accomplished styrofoam sculptor, it’s proving doable. The hope is to one day to create a craft the local kids can ride, something made from waste and sourced entirely from the atoll. 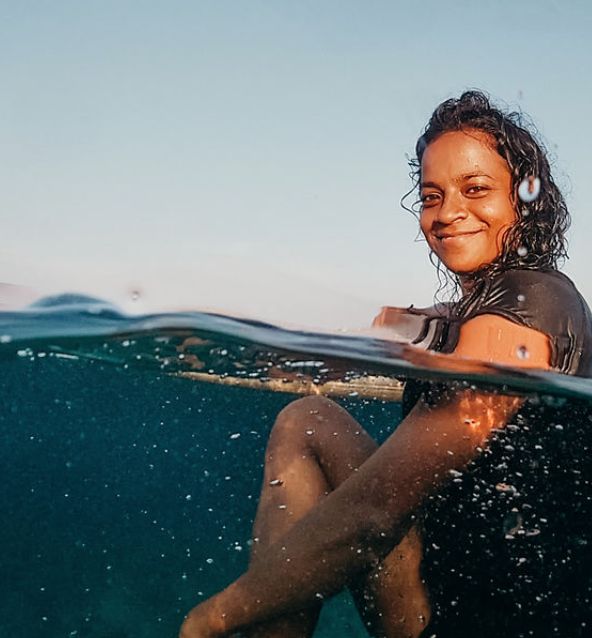 Until the prototype is launched, Soneva host community sessions, enabling the girls from nearby Island Eydafushi to sample surfing and the equipment needed to do it. During my time the local school bring their year 6 & 7 girls for a “watersports festival”. This is in fact a day of interactive learning where they receive tuition on surfing, SUP, kayaking, sustainability and marine biology. They are quiet at first but giggle as we do some standing stretches and once in the water, are full of laughs and bravado. Many claim they want to become surfing marine biologists by the end of the event, so its a wonderful sign that they’ve been inspired by this opportunity. Helping run the community day is surf manager Azoula. Azu started surfing at 18 (2005) in Male, Raalhugandu, she was a competitive swimmer, even representing the Maldives at the Asian games, so was a natural in the water. She didn’t have a proper lesson, but after some help from local surfers she stood up on a short board. From her first day she was hooked. She found it exhilarating despite it just being “baby waves”, yet gave her the taste and to keep going back for more. Each day at 5.30am she’d be up and in the water, getting stronger and faster and more confident. Now she’s helping Soneva Fushi deliver surfing experiences to guests and locals, along with helping run the clean water initiative Vitric. We talk about the gender divide, here on the local Islands and she tells me there are a few girls surfing, but they are still the minority. She wishes more took it up, and is glad that there are programmes that teach surf to girls in the Maldives, as they need encouragement and exposure to progressive ways of thinking. The older generation’s perspective about surfing is slowly shifting, and it’s starting to be recognised a sport, rather than an activity for drop outs. Unfortunately, its had a negative association with laziness, promiscuity and even drugs in the past - so it needs an identity make over to heal its cultural roots. For us, it’s a harmless, wave riding activity; a social (or solo), aquatic excursion but here there is much more under the surface. Why do humans have to make things so complicated? Under the surface of The Big Blue there is a whole world to be explored and the Baa atoll is famed for its manta ray cleaning stations. Groups of reef (4-5m) and oceanic mantas (up to 7m) come here to feed in the plankton rich waters, and with strict regulations regarding the Biosphere reserve, mean a team of rangers watching over them, making sure their waters are clean and tourists remain respectful. I enjoy snorkel sessions with the guests on outer reef, as well as making my own venture to the drop off, just a few metres away from the shore. It becomes a daily meditation, my mind quietens as I observe this multi-faceted world teeming with life. My favourite surfing session, which will remain with me forever, was a small day, without a breath of wind and with visibility of about 100% - meaning we could see the bottom at the local reef break. In the distance, the smoke from the local landfill dispersed into the atmosphere; a stark reminder, that nothing and nowhere is pristine these days. And then the epiphany came: A moment of Clarity. I no long enjoy going just surfing… it has evolved to be more than that. I enjoy surfing in small, clean, fun (non anxiety inducing waves) with people who appreciacte the art of sharing; I enjoy surfing in unspoilt waters where I can feel connected to life and become part of its cycle within the ocean ecosystem and I enjoy helping others to feel the joy, presence and empowerment that comes with tuning into this highly complex skill. The other bits about surfing… Well, you can have them. Just like surfers, the mantas come to the Baa atoll in specific months however, this year, for both groups, for some reason, the season extended 6 weeks later than usual. Times are changing, patterns are shifting. It would be easy to label “climate change” as the reason behind everything. Yet as a masters student of sustainability my focus is to challenge assumptions and I believe it is much more complex than that. We are wasting precious time arguing about what is happening and why; when it is it is crucial to listen and respond to changes, instantaneously. Luckily as surfers, we harness the power to make split second decisions due to our practice and experience riding ocean waves. We are the ones who train our intuition day in day out, to react with integrity, agility and fluidity and tune directly into natures vibrations. We can breathe in signs from the air, to help us understand if something is not right. We can look for signs in the water to give us information about the state of the oceans. And as we are migratory creatures, perhaps we can even understand the behaviours in other species, also searching for their source. Unfortunately as a travelling surfer, I’m well aware that I’m treading a huge hypocritical carbon footprint whenever I go jetting off into the sunset to satisfy my wanderlust in the aquamarine and azure coloured water destinations far away from dull Great Britain. But at least I’m aware, I tell myself. I leave these incredible Islands, reluctant to wear shoes but eager to channel more energy into riding waves in a more sustainable manner… which I guess, means no more trips to the Maldives.